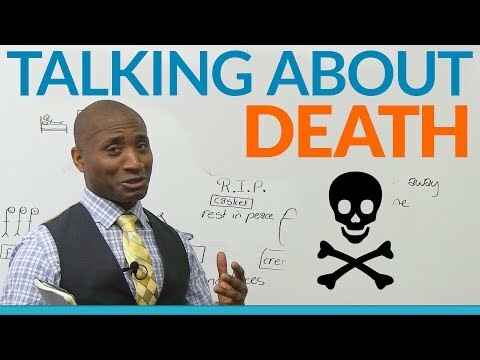 http://www.engvid.com/ Death is a part of life, but do you have the vocabulary you need to talk about it? In this lesson, I teach you everything you need to know to talk about death and dying, so that you can express yourself fully when you have to. You'll also learn some culturally accepted phrases which are used in many English speaking countries. Whether you are going to a funeral, or speaking to a friend who has lost someone, dealing with death can be unpleasant. Let's make sure that your English isn't the worst part of it! http://www.engvid.com/how-to-talk-about-death-in-english/ TRANSCRIPT [Sings] That's like the funeral march from Star Wars. If you know Darth Vader, "Luke, I am your father." And I am James, from EngVid. And I'm going to talk about, well, not a happy subject, but a subject we should talk about nonetheless. "Nonetheless" means "anyway", right? So what are we talking about? Death. In this case, it's Mr. D has died. Long live Mr. E. You may not have met Mr. D. He's from an unsuccessful website that was started and died. That's why he's gone. The king is dead. Long live the king. Mr. E is here. Right, E? Props. Okay. So let's talk about death. And I may be smiling too much and laughing too much, but you know what? Around the world, there are different ways to talk about or deal with death. And we're going to talk about a couple of different ways. But I'm going to give you the basic Western way of looking at death, okay? Now, number one, this person is dead -- well, this worm is dead. One of the things we say when someone dies -- we say this: pass away. If someone has "passed away", they've died. We don't always want to go, "Did he die? Is he dead yet?" You know? It kind of seems as little bit like, "Back up. Slow down." So we say they "pass away" like a gentle breeze. They fly away. Their soul goes, right? So if you say, "Johnny, Mr. D passed away last week", it means he died. So listen for Canadians when they say that, or Americans or British people. Did they "pass away". Or they might also say it this way. They might say "gone". "When did they go? Are they gone?" You're like, "No. Still dead." Sorry. That's bad. Okay. Enough "levity", which is fun or making light of something, okay? So let's talk about death. So if someone's gone or passed away, one of the things we like to say is "R.I.P. ", R.I.P. Some people rip one, but that's not what I'm talking about. "R.I.P." as in "rest in peace". You usually say that when you give your condolences. "Condolences." All these words. "Condolences." What is a "condolence"? A "condolence" is when you say, "I'm sorry about your loss." Usually for death. "I'm sorry your father has died. I'm sorry your mother has died. I'm sorry." It's a big sorry, condolence. "Do you have any condolences? Or I'd like to give my condolences. "All right? So they've died. They're resting in peace. Hopefully, they were good, right? Rest in peace, because they look so happy. Right? And you give your condolences. Guess what? You're not done. Unlike a wedding -- because funerals are like reverse weddings except the person gets to live through it. You've got to go to the funeral, right? Usually, before the funeral -- or part of the funeral -- is the viewing. Notice we have these people watching a picture? Well, this is when you go and see the person in their casket. See? Mr. D is in a casket. That's the thing we put them in after they die. They die; we put them in a casket. And then, you can go to a viewing. The "viewing" is you walk by -- yes. Believe it. There's a dead body -- okay. Look. Picture this. There's a dead body in the room. There are people dressed in shirts and ties like this. They walk by, and they look at the dead person. And they say things like, "I'm sorry you're dead. It was nice knowing you. Rest in peace. See you later, Chuckles." Or, "You're next." Right? So you view. You take a look at the dead body, okay? Another word to say besides that is -- because some people say -- oops. Sorry. I want to say "coffin". C-o-f-f-i-n, "coffin". A "coffin". So a "casket", "coffin". Another way of saying what this is, okay? They say, "Look at the coffin", or you buy the casket -- you buy the casket. When you put the body in it, it become a "coffin". That's the difference. You say, "How much is the casket?" Coffin. Rest in peace, dude. Okay. So not everybody goes through this process. And we'll get to that after. But you go for the viewing. You look at the person in their coffin. All right? Now, what are you going to do with this thing? Well, you're going to have to put it in the ground. And that's what we call the "burial". We bury it. We put it. You go there. They pick up the earth. They put the coffin in the ground, and they bury it. Okay? That's what we basically call the "basic funeral". Notice these people don't look happy because there's no fun in a funeral, Son. Yeah. Okay. Moving on. Bad joke, bad joke. Okay.